Inside a small metal cell, a tiger lies nearly motionless on a filthy concrete floor. Another cat paces back and forth past her, covering each edge of the space with an obsessive focus. There’s nothing to climb and no room to run — so it’s all the animals can do to make the time pass by. The light has all but left their eyes. They don’t know it yet, but their days are numbered. Soon, they’ll be killed to become a decorative rug or someone’s dinner. 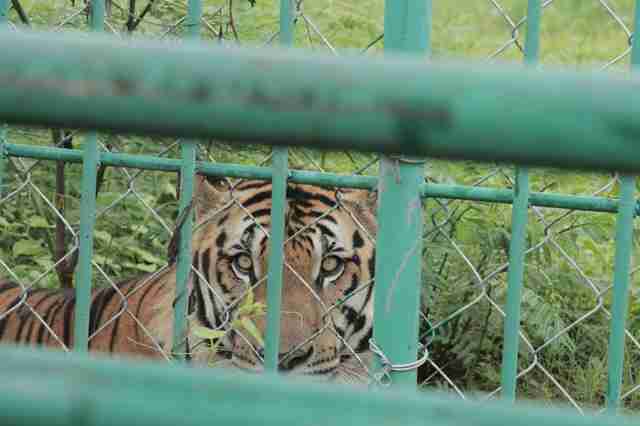 Across Asia, this is the sinister reality for thousands of tigers kept in what appear, on the outside, to be zoos. 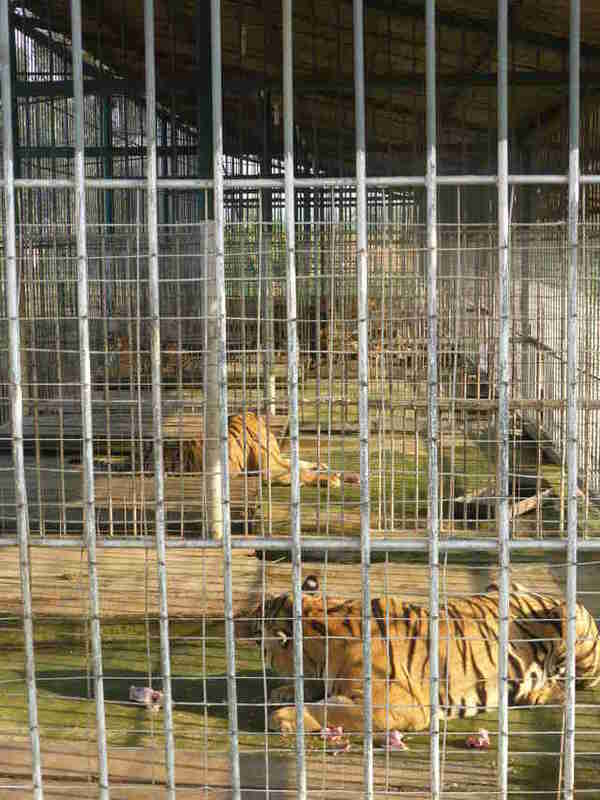 They’re actually farms, where tigers are bred and kept in small cages until they’re slaughtered. 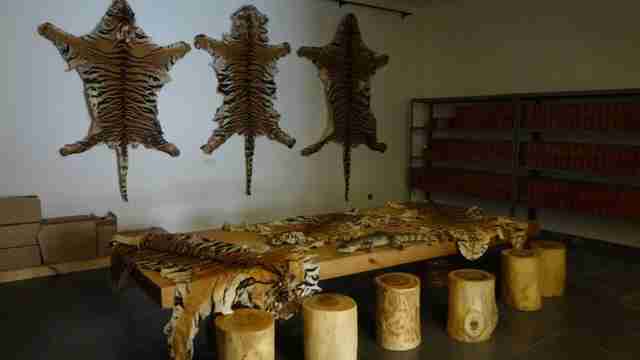 Their bones are broiled and turned into “tiger wine”; their stunning furs turned into pelts or stretched into roaring stuffed tigers; and their flesh sauteed and served up at restaurants. It’s an industry that has seen a booming demand in the past decade in countries like China, Vietnam, Thailand and Laos, where these “luxury” goods are produced and sold to buyers. It’s turned endangered animals into a commodity — and is part of the reason why there are more tigers in captivity than the meager 3,900 left in the wild worldwide. 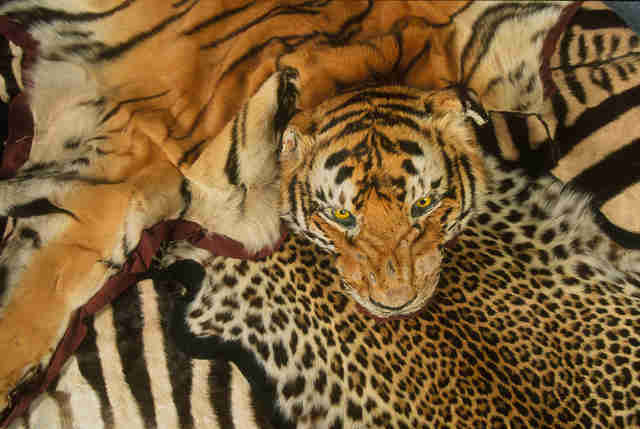 Debbie Banks, campaign manager of tigers and wildlife crime for the Environmental Investigation Agency (EIA), has been studying this quickly-expanding trade for years. In 2014, she traveled to a tiger product hotspot: the Golden Triangle Special Economic Zone in Laos, a landlocked country between China and Thailand. The enclave, simply put, is a lawless playground of illicit gambling and duty-free shopping — but it’s also a nightmare for animals. And down the path from the restaurants are rows of tiny holding pens, filled with tigers. 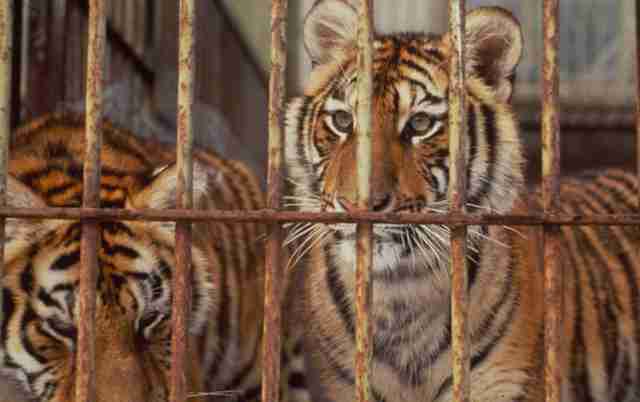 These tigers, in Laos as in other Asian countries, are born and killed in captivity. But it’s putting wild populations at risk, too. While the Golden Triangle Special Economic Zone in Laos only holds around 30 live tigers at a time, WWF estimates there are hundreds of the animals being kept captive across Laos alone for the purpose of being turned into wildlife products. Farms in Asia often disguise themselves as private zoos or animal clinics, when the facilities’ true intent is to kill the endangered animals. 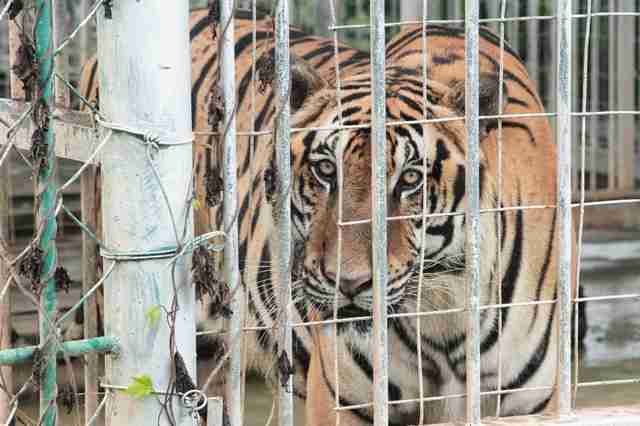 “It’s very difficult to tell [how many tigers are killed each year] given that there are so many unregistered tigers in farms or private zoos, many of whom will be killed and harvested for their bones and organs,” Henry said. Inside the farms themselves, the facilities look like traditional, cramped factory farms. 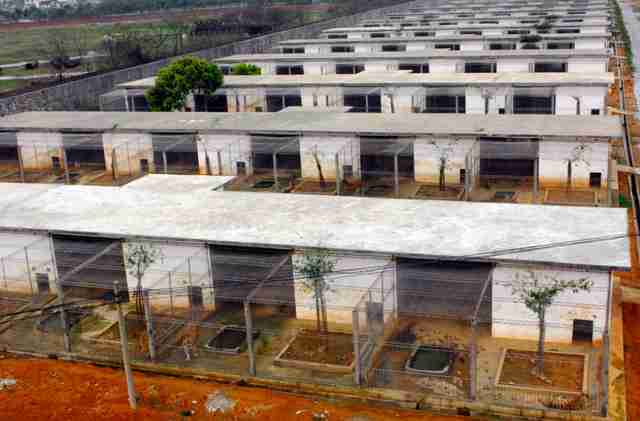 Rows upon rows of small pens house up to three tigers each and provide no enrichment. The tigers are killed at 2 or 3 years of age, once they reach full-grown weight. “They are usually killed by electrocution, an overdose of lethal drugs, strangulation (by putting a noose around the neck) or a combination,” a source close to the Laos farming industry told The Dodo. The source wished to remain anonymous for privacy reasons. The animals’ lives on the farms, from the moment they’re born to when they’re slaughtered, are despondent. Some of these facilities, particularly in Thailand, offer up-close and personal interactions with the cubs and adult tigers, who are often drugged, with the promise that the funds support tiger conservation. Unsuspecting tourists who seek out “tiger selfies” are very likely supporting tiger slaughter in the process, Banks said. This issue took center stage two years ago when investigators raided the infamous Tiger Temple, a claimed wildlife sanctuary and popular tourist spot in Thailand that was accused of secretly farming its tigers for sale on the black market. 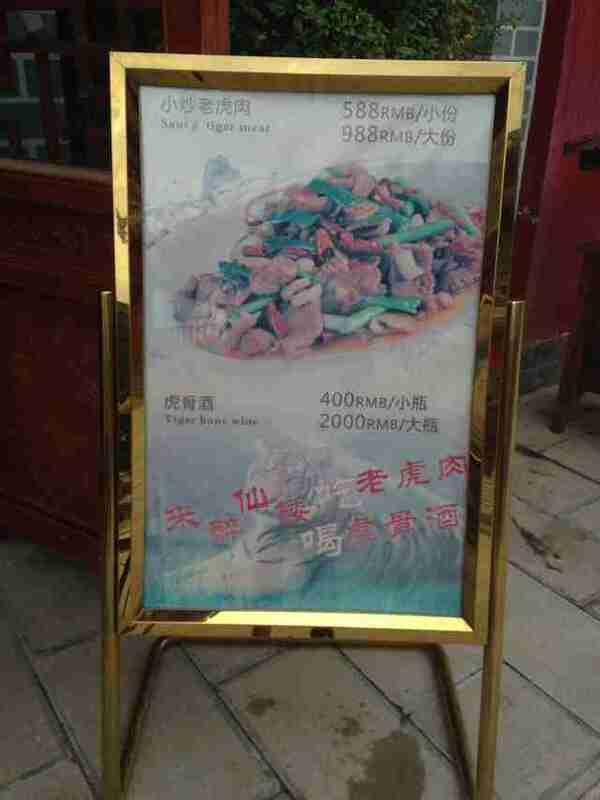 Officials discovered the bodies of 40 tiger cubs inside freezers on the property, in addition to several tiger skins and fangs and amulets made from tiger parts. A slaughterhouse and holding facility was also later connected to the temple during the investigation. The facility was supposed to surrender its animals and close, but since then a zoo license has been issued to an offshoot entity and it’s still operating today. Wildlife advocates have seen similar counteractive responses by the government to the Golden Triangle facility in Laos — a sign that the wildlife crimes are simply not taken seriously. With so many tigers trapped in farms across Asia — and no cease of demand for their products in sight — advocates are met with challenges. The first step toward helping the tigers escape the trade, Banks said, is working with government officials to stop captive breeding. Another challenge to eventual farm shutdowns will be finding safe, reputable sanctuaries for the thousands of tigers to retire into. Vietnam faced a similar issue in 2002 when it banned the farming of bears for their bile. Rescue groups like Animals Asia have managed to rescue some of the animals, but hundreds still languish in their barren cages in the care of their owners. While Laos has announced it hopes to pursue a phase-out plan for its tiger farms, the fate of the captive tigers in other countries is even more uncertain — especially in China, where tigers are functionally extinct in the wild but thousands exist in captive farms. At the London Conference on Illegal Wildlife Trade this October, Banks is hopeful that the EIA will further push China, Vietnam and Thailand to follow Laos’ intention to phase out tiger farms. Until then, the group urges the general public to stay informed, too. There are fewer than 4,000 tigers left in the wild, and many are being poached so their parts can be used in traditional medicine. Project C.A.T. is working to protect tigers for years to come by supporting nearly 2 million acres of protected habitat — part of a global effort to double the number of wild tigers by 2022. Find out how you can help here.